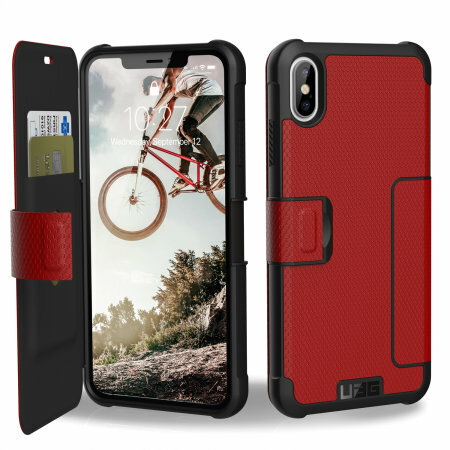 Equip your iPhone XS Max with extreme, military-grade protection and storage for cards with the Metropolis Rugged Wallet case in magma from UAG. Impact and water resistant this is the ideal way of protecting your phone and providing card storage. I may be a little harsh but after just a few weeks the edges are starting to look a little tired which isn't helped by the colour which seems to show every mark. The case doesn't appear to wipe clean either. It would also be nice if the case allowed the phone to stand up on it's in portrait mode. Service from Mobile fun however was pretty good! Its quiet light weight, fitting is good, generally I used to avoid using full mobile case ie a case enclosing a mobile from all sides as I used to find them increasing the bulk, but as iPhone Xs Max is expensive, hence using this case, but suprisingly this case is quiet skinny and offers protection from scratches.